The recent heatwave and drought could be having a deeper, more negative effect on soil than we first realised say scientists. This could have widespread implications for plants and other vegetation which, in turn, may impact on the entire ecosystem. The new study, led by researchers at The University of Manchester and published today (02/08/2018) in Nature Communications, provides new insight into how a drought alters soil at microbial level. It shows that expected changes in climate will affect UK soil and that soil is not as tough as previously thought. Due to climate change, disturbances such as drought are increasing in intensity and frequency. These extreme weather conditions change vegetation composition and soil moisture, which in turn impacts the soil's underlying organisms and microbial networks. By studying how microbes react to severe drought, the study provides a better understanding of how underground soil networks respond to such environmental disturbances. Lead author, Dr Franciska de Vries, from Manchester's School of Earth and Environmental Sciences, explains: "Soils harbour highly diverse microbial communities that are crucial for soil to function as it should. "A major challenge is to understand how these complex microbial communities respond to and recover from disturbances, such as climate extremes, which are predicted to increase in frequency and intensity with climate change. "These microbial communities within the soil play a crucial role in any ecosystem. But it wasn't known how soil networks respond to such disturbances until now." Sequencing of soil DNA for the study was conducted at the Centre for Ecology & Hydrology (CEH). 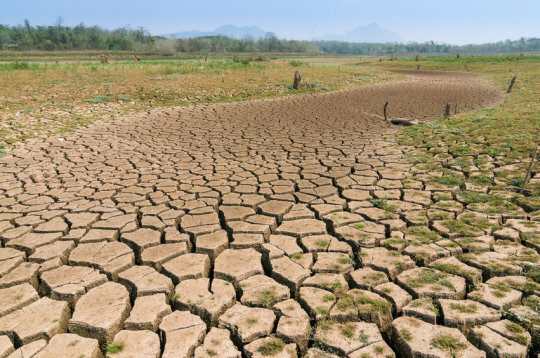 Dr Robert Griffiths, a molecular microbial ecologist at CEH, said: "This study further identifies those key organisms affected by drought, which will guide future research to predict how future soil microbial functions are affected by climate change." The research team tested the effects of summer drought on plant communities consisting of four common grassland species. They found that drought increased the abundance of a certain fast-growing, drought-tolerant grass. With greater aboveground vegetation comes an increased rate of evapotranspiration, or cycling of water from plants to the atmosphere, lowering the overall soil moisture. Professor Nick Ostle, from the Lancaster Environment Centre, said: "Our hot and dry summer this year is a 'wake up' to prepare for future weather stresses. We have just had the hottest ten years in UK history. This work shows that continued summer droughts will change soil biology. This matters as we plan for ensuring food security that depends on healthy soil." Unlike past research, this study considered the multitude of direct and indirect interactions occurring between different microbial organisms in soil. Rather than focusing on select attributes of bacteria and fungi, this research takes a comprehensive approach to studying soil ecosystems.